Purchasing a theater projector for the home requires a variety of considerations. You want to ensure that your projector is appropriate for the space, distance and brightness you need for your lifestyle. By recognizing the specs you want to look into as well as the standards you need for a projector in your home, you find the right option for your specific goals. Before taking any measures to find a home theater projector, calculate the size of the space and the distance between the screen and the placement of the projector. A small room does not require the same lumens or resolution as a larger space. You also want to consider the amount of ambient light in the room to ensure visibility and proper contrast when selecting a projector. Lumens refer to the brightness on your screen. As a general rule, most home projectors need a brightness of roughly 1,000 to 1,200 lumens; however, the lighting in the room and the details in regards to brightness impact your decision. Brightness in a projector falls into two categories: white and color brightness. Ideally, you want as similar figure for the white and color brightness to avoid dull or dark visuals. You may also need higher lumens if you have a large space or the room has more ambient light that may complicate the visual. The material of your projector screen also plays a role in proper brightness and contrast figures, so you want to evaluate your space carefully before purchasing a home theater projector. The contrast ratio is not as important as the lumens on your projector, but it does play a role in the decision regarding your options. The ratio refers to the amount of difference between dark and light areas of the screen. A high contrast ratio means greater depth and dimension due to the clear definition between light and dark colors. It adds greater depth to the shadows, which impacts your visuals in a home theater. Since you will usually use a home theater projector in a dark space, you want a higher contrast ratio to get the best picture quality. The resolution for your projector is the number of pixels you see on the screen. In most cases, a high definition resolution includes 720p, 1080p and 4K projectors. Be cautious when selecting resolution to avoid a low-resolution projector. It is possible to find projectors with a resolution as low as 480p and that may not provide the clarity you expect in your home theater. If you want a high definition resolution, then you will want a projector with 1080p or higher resolution. Lower resolutions may seem pixilated or lack clarity, even if you have excellent contrast ratios and proper brightness for the space. Although the screen is only part of the decision-making process, it does play a role in selecting an appropriate projector for your home theater. If you already have a screen in your space, then you must consider the color, size and material of the screen as part of the process. Gray screens are usually used in spaces with more ambient light and less control over the lighting conditions. When you can make the room completely dark, a white screen provides greater picture clarity. You also want to consider the specs of the screen. Look at the amount of gain, or the reflection of the screen, as well as the size of the screen. Ideally, the screen should be the same aspect ratio as the projection. The aspect ratio is the type of projector image and falls into 4:3, 16:9 or 2.4:1 on most home theater projectors. The gain, or reflection of light, impacts your image by adjusting the brightness. A gain of 2.0 will reflect more light and result in a brighter picture when compared to a screen with a gain of 1.0. In most cases, you want a mid-range gain on the screen to avoid dulling at the edges of the screen or in spots on your screen. Projectors for your home theater differ in environmentally friendly aspects. The light source plays a key role in the environmental aspects of the projector. In most cases, a laser or LED light source is more energy efficient and environmentally friendly than a traditional standard lamp. Lasers are ideal because it does not require constant bulb replacements after a certain number of videos. Selecting a projector for your home is a process that requires a variety of considerations. You want to look into the appropriate brightness for your space, the screen and the potential impact on the environment before narrowing down your options and selecting a projector for your home theater system. When it comes to setting up your home theater projector you will have to consider the video source for the content you are projecting. There are great advantages to permanently mounting your projector to the ceiling. One drawback of that is cable management. It can be incredibly costly and complicated to run wires through walls, or unsightly to have them strung across the ceiling and down the walls. A great solution is connecting a wireless transmitter and receiver system, allowing you to wirelessly stream your content from a source anywhere in your room. You can have a mounted projector while still having your Blu Ray player, or cable box in a convenient location. 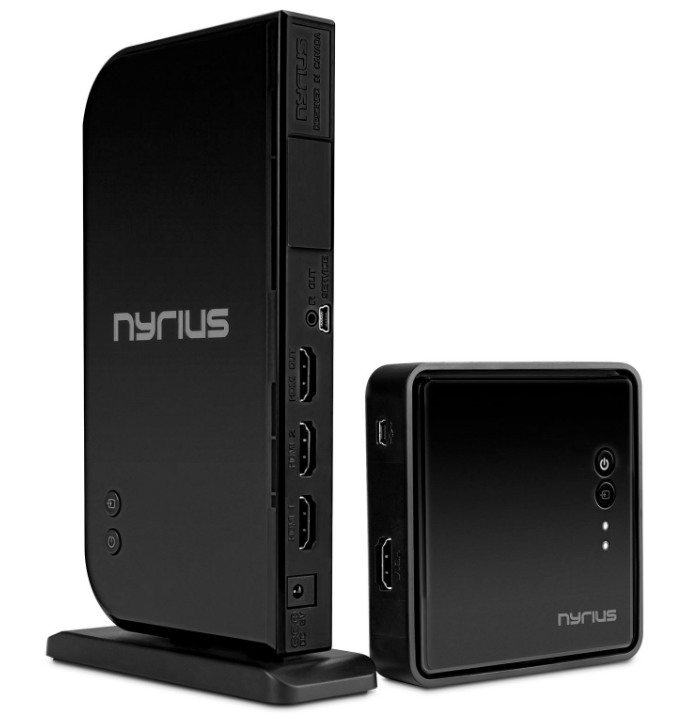 Check out the Nyrius Aries Pro for the best solution for wireless video transmitting.